The nociceptin receptor (or NOP; also known as ORL-1 or the kappa-type 3 opioid receptor) is the target of a small protein ligand called nociceptin/orphanin FQ peptide (or N/OFQ). N/OFQ is related to the opioid class of compounds (these are the pain relieving drugs, like morphine), but unlike the other opioid compounds N/OFQ does not act at the classic opioid receptors which typically function as pain relievers. Rather N/OFQ has its own receptor, which I mentioned above: NOP. By binding to NOP, N/OFQ initiates functions involved in numerous activities, such as pain sensation, fear learning, and the sense of reward (Click here for a good review of everything one could want to know about NOP & N/OFQ). Does it have anything to do with Parkinson’s? Title: Nociceptin/orphanin FQ and opioid receptor-like receptor mRNA expression in dopamine systems. Authors: Norton CS, Neal CR, Kumar S, Akil H, Watson SJ. Journal: J Comp Neurol. 2002 Mar 18;444(4):358-68. In this study, the researchers wanted to look at whether dopamine-producing cells in the brain actually have NOP receptors on them. They already knew from previous research that N/OFQ could influence dopamine-related activity, but they did not know if this was via a direct interaction with the dopamine cells or if it was an indirect influence (via a different cell type). So the investigators took sections of rat brain from the area called the midbrain – where the bulk of the dopamine neurons live – and they went looking for where NOP and N/OFQ are localised. The researchers found that very few dopamine neurons produce any N/OFQ, but a very high percentage (>50%) of them had NOP. Next, they gave some rats a neurotoxin (6-OHDA) which kills the dopamine neurons, and then looked to see what happened to NOP and N/OFQ levels. NOP levels in the midbrain dropped by 80%. Title: Blockade of nociceptin/orphanin FQ transmission attenuates symptoms and neurodegeneration associated with Parkinson’s disease. Authors: Marti M, Mela F, Fantin M, Zucchini S, Brown JM, Witta J, Di Benedetto M, Buzas B, Reinscheid RK, Salvadori S, Guerrini R, Romualdi P, Candeletti S, Simonato M, Cox BM, Morari M.
Journal: J Neurosci. 2005 Oct 19;25(42):9591-601. In this study, to determine if N/OFQ is beneficial for dopamine neurons, the researchers firstly treated dopamine neurons with N/OFQ and then recorded the activity of those cells. They found that N/OFQ inhibited the firing of dopamine neurons (by causing them to hyperpolarize). This caused a reduction in the amount of dopamine being released from these cells. Next, the investigators treated rodents with a NOP receptor antagonist (so this would block the receptor), called UFP-101, and they found that this caused an increase in dopamine release. Another NOP receptor antagonist J-113397 had the same effect, confirming that this effect was caused by blocking normal N/OFQ signalling. When rodents were treated with N/OFQ, it caused behavioural impairments – the animals had trouble on movement related tests. And this inhibitory role of N/OFQ on motor activity was further strengthened by the observation that mice that have been genetically engineered to produce no NOP receptor outperformed normal mice on the tests of motor behaviour. These results led the researchers to conclude that N/OFQ may contribute to inhibitory state observed in Parkinson’s – an increase in N/OFQ levels as dopamine neurons are being lost, would result in more inhibited movement. And in a follow up study, these same researchers found that N/OFQ levels were approximately 3.5x higher in the cerebrospinal fluid of people with Parkinson’s than normal control subjects (Click here to read the abstract of that follow up study). Title: Nociceptin/orphanin FQ receptor agonists attenuate L-DOPA-induced dyskinesias. Authors: Marti M, Rodi D, Li Q, Guerrini R, Fasano S, Morella I, Tozzi A, Brambilla R, Calabresi P, Simonato M, Bezard E, Morari M.
In this study, the same researchers wanted to determine what effect N/OFQ (or a synthetic N/OFQ receptor agonist) could reduce L-dopa induced dyskinesias in an animal model of Parkinson’s. 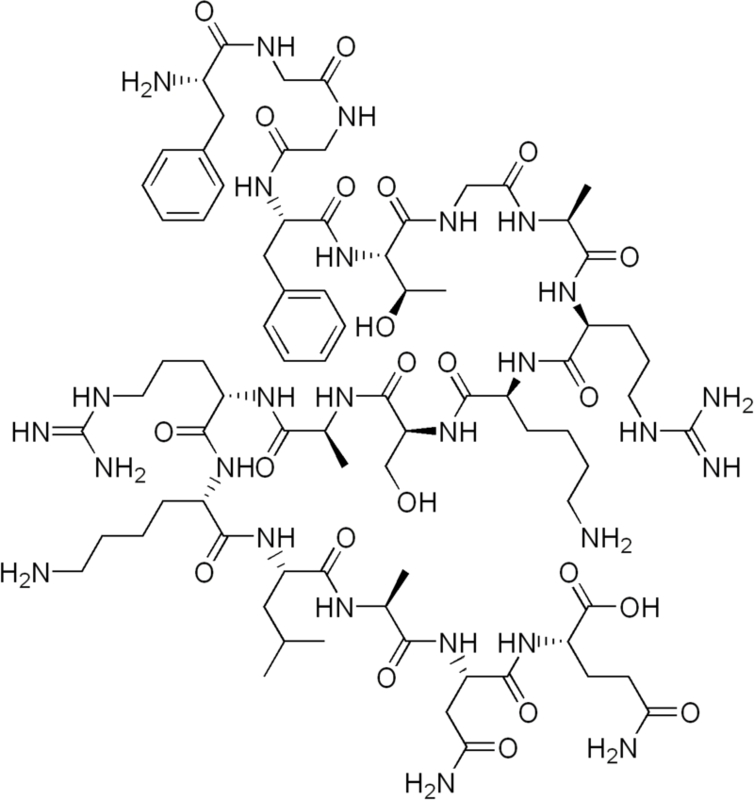 Dyskinesias (from Greek: dys – “abnormal”; and kinēsis – “motion, movement”) are simply a category of movement disorders that are characterised by involuntary muscle movements. And they are certainly not specific to Parkinson’s. In Parkinson’s, dyskinesias are associated with the long-term use of L-dopa (also known as Sinemet or Madopar) treatment. How do dyskinesias develop in Parkinson’s? L-dopa (or Levodopa) tablets provide the brain with the precursor to the chemical dopamine. Dopamine producing cells are lost in Parkinson’s, so replacing the missing dopamine is one way to treat the motor features of the condition. Simply giving people pills of dopamine is a non-starter: dopamine is unstable, breaks down too quickly, and (strangely) has a very hard time getting into the brain (it is blocked by the protective layer called the blood-brain-barrier). L-dopa, on the other hand, is very robust and has no problem entering the brain. Once inside the brain, L-dopa is quickly converted into dopamine. It is changed into dopamine by an enzyme called DOPA decarboxylase which is present in many different cells in the brain. And this conversion rapidly increases the levels of dopamine in the brain, allowing the locomotion parts of the brain to function more normally. In understanding this process, it is important to appreciate that when an L-dopa tablet is consumed and L-dopa enters the brain, there is a rapid increase in the levels of dopamine. This ‘spike’ in the supply of dopamine will last for the next few hours, before the dopamine is eventually used up. As the effects of the L-dopa tablet wear off, another tablet will be required. This use of multiple L-dopa pills across the day gives rise to a wave-like shape to the dopamine levels in the brain over the course of the day (see the figure below). The first pill in the morning will quickly lift the levels of dopamine enough so that the individual will no longer feel inhibited or akinetic (akinesia is a state of being unable to move). This will allow them to be able to function with normal controlled movement for several hours before the L-dopa begins to wear off. As the L-dopa wears off, the dopamine levels in the brain drop back towards levels that will leave the person feeling inhibited and at this point another L-dopa tablet is required. After several years of L-dopa use, many people with Parkinson’s will experience a weaker response to each tablet. They will also find that they have more time during which they will be unable to move (exhibiting akinesia). This is simply the result of the progression of Parkinson’s – L-dopa treats the motor features of the condition, but only hides/masks the fact that the disease is still progressing. In the image below, you can see the dark grey area slowly increasing in size – which represents the progression of the condition. And it should be noted here that each individual has a different response to L-dopa and it is currently impossible to predict when (or even if) someone will develop dyskinesias (the time frame provided on the image above is purely an example). In some cases dyskinesias can take decades to appear. Ok, so what did the N/OFQ researchers do next? The researchers gave N/OFQ (or a synthetic N/OFQ receptor agonist called Ro 65–6570) to a rat model of Parkinson’s. The rats had been treated with high levels of the standard Parkinson’s medication (L-dopa), and the investigators found that N/OFQ (and the N/OFQ receptor agonist) reduced L-dopa induced dyskinesias in these animals, without causing hypo-locomotive (or a reduction in movement ability) effects. They next conducted the opposite experiment and found that treating these animals with NOP receptor antagonists (which you will recall from above, increase dopamine release) worsened the L-dopa-induced dyskinesias. The researchers then turned their attention to primate models of Parkinson’s (MPTP) with L-dopa-induced dyskinesias, and they found that systemic treatment with the N/OFQ receptor synthetic agonist also reduced dyskinesias in these animals, without affecting the therapeutic effects of L-dopa on movement range, rigidity, and tremor (the treatment also improved posture). Title: Anti-Parkinsonian and anti-dyskinetic profiles of two novel potent and selective nociceptin/orphanin FQ receptor agonists. Authors: Arcuri L, Novello S, Frassineti M, Mercatelli D, Pisanò CA, Morella I, Fasano S, Journigan BV, Meyer ME, Polgar WE, Brambilla R, Zaveri NT, Morari M.
Journal: Br J Pharmacol. 2018 Mar;175(5):782-796. In this very recent study, the researchers wanted to investigate the efficacy of two novel, potent (and chemically distinct) NOP receptor agonists (AT-390 and AT-403), in their ability to improve the motor features of Parkinson’s and reduce dyskinesias. These two drugs are owned by a biotech company called Astraea therapeutics – which is “a discovery-stage biopharmaceutical company, focused on the discovery and preclinical development of small-molecule therapeutics for the treatment of drug addiction and central nervous system disorders“. In rodent models of L-dopa-induced dyskinesias, the researchers found that only AT-403 reduced dyskinesias without causing sedation, so they next sought to determine if co-treatment of AT-403 with L-dopa could slow the development of dyskinesias. Overall, AT‐403 did not protection against dyskinesias, but the AT‐403‐treated rats did demonstrate a tendency to be less dyskinetic than controls throughout the study. And this resulted in better results in the motor behaviour tests. The investigators concluded that while NOP receptor agonists hold great promise with dyskinesias, “further studies are needed to pin down the neurobiological substrates of the anti‐dyskinetic and sedative and hypo‐locomotive effects in order to develop NOP receptor agonists”. Expect to see more research regarding the use of NOP receptor agonists to control dyskinesias in the near future. Interesting. So are drugs targeting NOP receptor only focused on treating dyskinesias? 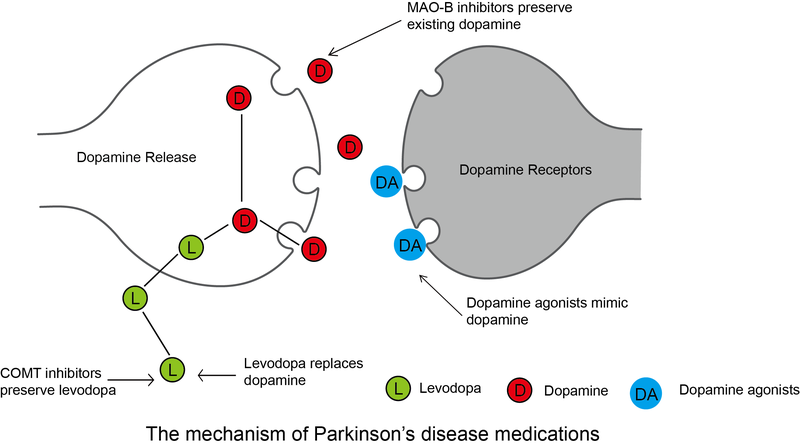 Title: Genetic and pharmacological evidence that endogenous nociceptin/orphanin FQ contributes to dopamine cell loss in Parkinson’s disease. Authors: Arcuri L, Viaro R, Bido S, Longo F, Calcagno M, Fernagut PO, Zaveri NT, Calò G, Bezard E, Morari M.
Journal: Neurobiol Dis. 2016 May;89:55-64. The researchers who conducted this study injected two groups of mice (normal mice and genetically engineered mice with no NOP receptor) with a neurotoxin used to model Parkinson’s (MPTP), and they found that the mice without NOP receptor had significantly less dopamine cell death (40% loss) when compared to the normal control mice (75% loss). They also found that a NOP receptor antagonist (SB-612111) reduced the MPTP-induced neurodegeneration in mice. 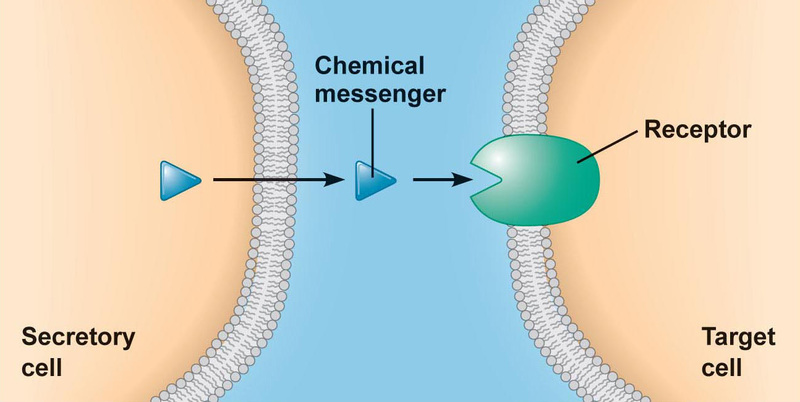 Remember that a NOP receptor antagonist blocks the receptor from being able to do its job. Normal mice were given the neurotoxin and then 4 days later the investigators started treating half of those mice twice daily treatment with SB-612111. The NOP receptor antagonist almost completely prevented the loss of dopamine neurons. This delayed treatment approach is more disease-relevant, thus making these results more interesting. Next the investigators wanted to demonstrate the neuroprotective potential of NOP receptor antagonists in a more disease-relevant model of Parkinson’s. They injected viruses containing a mutated form of human alpha synuclein (p.A53T) into the substantia nigra of rodents. They then started treating the animals with SB-612111 twice daily for 8 weeks (starting from one week after the virus was injected). At the end of this treatment regime, the number of dopamine neurons spared was significantly greater in SB-612111-treated rats (50%) when compared to the placebo-treated controls (25%). Interestingly, the SB-612111 treatment did not affect the total amount of alpha synuclein in the dopamine neurons, so this neuroprotective effect was not due to reducing level of alpha synuclein. These results led the researchers to conclude that “NOP receptor antagonists might prove effective as disease-modifying agents in Parkinson’s disease, through the rescue of degenerating nigral dopamine neurons and/or the protection of the healthy ones“. Authors: Collins LM, Dal Bo G, Calcagno M, Monzón-Sandoval J, Sullivan AM, Gutierrez H, Morari M, O’Keeffe GW. Journal: Mol Neurobiol. 2016 Dec;53(10):7284-7297. In this study, the researchers found that N/OFQ had a detrimental effect on the development and survival of dopamine neurons grown in culture. The growth of the neuron’s branches (called axons) was significantly reduced due to N/OFQ treatment. N/OFQ treatment also exaggerated the effects of neurotoxins (6-hydroxydopamine and MPTP) on human dopamine neurons grown in cell culture. And again the investigators concluded that these results “support the theory that NOP receptor antagonists may represent a novel class of neuroprotective therapy for” Parkinson’s. So are there any NOP receptor antagonists in the clinic? Title: A Selective Nociceptin Receptor Antagonist to Treat Depression: Evidence from Preclinical and Clinical Studies. Authors: Post A, Smart TS, Krikke-Workel J, Dawson GR, Harmer CJ, Browning M, Jackson K, Kakar R, Mohs R, Statnick M, Wafford K, McCarthy A, Barth V, Witkin JM. This was a proof-of-concept, double-blind, placebo controlled study that evaluated BTRX-246040/LY2940094 in people with major depression. Once daily oral dosing of the drug for 8 weeks found that BTRX-246040 was well tolerated and provided some evidence for an antidepressant effect (the study was too small to demonstrate anything statistically significant; Click here to read more about this clinical trial and click here to read about a separate safety trial in healthy individuals). We haven’t got to the really interesting part yet! “These preclinical data support our rationale for advancing BTRX-246040 into the clinic in Parkinson’s disease, where NOPR antagonism may improve both the motor and depression symptoms associated with that disease,” said Annette Madrid, M.D., chief medical officer of BlackThorn Therapeutics. ”We plan to initiate a Phase 2a clinical trial in Parkinson’s disease in 2018.” – Click here to read the full press release. It should be noted that Blackthorn therapeutics is backed by biotech investors Johnson & Johnson Innovation and Arch Venture Partners (among others). Arch is a backer of another exciting Parkinson’s-related biotech firm called Denali Therapeutics (which we have previously discussed here at the SoPD – Click here to read that post). So, hopefully, there will very shortly be news regarding clinical testing of BTRX-246040 in Parkinson’s. This is a post I have been wanting to write for a while. An important part of this website is to bring to the reader’s attention new or little recognised pieces of research that could have a major impact on not only how we treat Parkinson’s, but also on how we could potentially slow down the progress of the condition. Drugs targeting NOP and N/OFQ could provide options on both of these counts. Manipulations on this receptor/ligand pairing have demonstrated the ability in pre-clinical models of Parkinson’s to influence both dyskinesias and neuroprotection (using agonists and antagonists, respectively). And the positive news in this case is that there are candidate drugs being tested in clinical trials, and the companies associated with those compounds are eyeing up Parkinson’s as an additional potential opportunity. Thus, there is reason for NOP… sorry, I meant hope. Thank you so much for the huge amount of effort you put into this site, Simon. Apart from the fact that it’s very interesting and explains really clearly stuff I never expected to understand 🙂 , it gives me and Im sure very many others, hope ( or is it NOP?!) Think it’s a day to dance ( badly!) around the kitchen! Thanks for your comment – glad you like the site. The idea is not about giving folks ‘hope’ and reasons to dance, but rather to make people aware of everything that is going on in the world of Parkinson’s research (and honestly, we are only scratching the surface!). As researchers share their findings with each other – in language that even some of us researchers struggle with at times – it is easy for the PD community to be left behind and left wondering what (if anything) is actually happening. And that would be the worst of all worlds. As we start to move away from basic symptomatic medications like L-dopa and into more exotic stuff like immunotherapy and DUB inhibitors, the PD community needs to have a basic understanding of the science underlying these things if they are to make an information decision to partake in clinical trials for example. Plus, the feedback from the PD community to a lot of what is presented here and elsewhere is very useful for the research community. It’s a win-win situation. Nope, I hadn’t heard of NOP. So thank you, Simon. I (and I’m certain many others as well) appreciate all you do. Our appreciation cannot be overstated nor given too frequently, so here it is. Thank you!